Last week Washington appeared to make its airwar against the Taliban official by relaxing its rules in Afghanistan. The military now has explicit permission to proactively support the stretched Afghan security forces on the battlefield. Between January and May 2016 451 weapons were released compared to just 189 in 2015. Under the new policy, the US commander in Afghanistan, General John Nicholson, who took control in March, will be able to assign troops to accompany regular Afghan soldiers at key moments in their offensive campaign. Until now only Afghan special forces have had such close cooperation. US commanders will have greater discretion to carry out airstrikes against the Taliban as well. There are currently around 15,700 international troops in Afghanistan with nearly 12,800 working on Resolute Support, Nato’s “train, advise, assist” mission. These soldiers are drawn from Nato members and non-Nato “partner countries”, such as Georgia and Ukraine. The extra 2,900 are US soldiers in the country on offensive combat operations as part of a parallel counter-terror mission. The US Air Force (USAF) carries out strikes for both Resolute Support and the counter-terrorism operations. In January 2016 the rules governing the counter-terror operations were changed to allow the USAF to hunt out Islamic State fighters as well as al Qaeda fighters. The US has been “aggressively pursuing these targets” from the air, according to Brigadier Charles Cleveland, Resolute Support’s deputy chief of staff for communication. But of the 347 air strikes in the first five months of the year, 213, equivalent to 61%, were described as defensive, force protection strikes, according to the US press office in Kabul. US officials generally describe these strikes as being used “to counter a threat to the force”. They do not elaborate on what threat or what force. Data also shows that there has been a dramatic increase in the number of hits by the US Air Force. Between January and May 2016 451 weapons were released in these airstrikes compared to just 189 in the same period in 2015. Working closely with Afghan partners puts Coalition troops into harm’s way and in such a situation the US can carry out airstrikes to protect ground forces under attack. The ground troops do not have to be “engaged in combat situations” for the US to strike, Cleveland added. These defensive strikes can be conducted against the Taliban “if we identify that a threat to the force is developing,” he told the Bureau. Kate Clark of the Afghan Analyst Network, a highly respected think tank said the rise in the proportion of airstrikes against the insurgency was a pragmatic response to a deteriorating situation. The contradiction between the reality and the political position in Washington that combat operations are over was “the result of having a conflict between military needs and political imperatives, having to say one thing and do another,” she added. 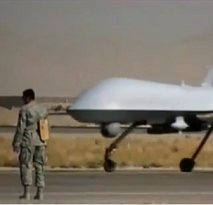 Last month a US military drone killed the Taliban’s leader, Akhtar Mansour, for example. The strike was particularly controversial as US military operations crossed over the border into Pakistan where Mansour was based. All strikes in Pakistan before this point had been conducted as part of the US covert war on terror operated by the CIA. The May 21 strike, which caused much outcry in Pakistan, was justified by the US as a defensive action. Obama commented on Mansour’s threat to American lives. In September and October last year a team of Green Berets also took part in an operation to retake Kunduz, the first provincial centre to fall to the Taliban since 2001. The attack was widely reported after a US airstrike flattened a hospital operated by the international medical charity Medecins Sans Frontieres. Troops were operating with both mandates during the effort to retake Kunduz. US forces conducted 22 strikes in the city as the Green Berets and Afghan partners battled to liberate the city. Nine were conducted using counter-terrorism rules, 13 under a self-defence remit. US troops in Afghanistan are due to be cut to just 5,500 by the start of next year. A White House press officer said the policy shift last week to widen the remit of US troops in Afghanistan was not a reflection of a change to this plan. At a press conference last Friday the White House spokesman said: “The US combat role in Afghanistan ended at the end of 2014, and the President is not considering restarting it.